The Research Technical Services (RTS) Department at Graniterock is responsible for providing a range of materials laboratory and field services to Graniterock Divisions and Branches. Our services add value to Graniterock construction products and services by helping to assure they are of the highest possible quality. Designing aggregate-product blends which will meet local, California, and national/federal (e.g. ASTM, FAA, Corps of Engineers) specifications while improving the properties of concrete, hot mix asphalt, and base course materials. Regularly sampling and laboratory testing of aggregate products from Graniterock production sources to ensure they meet strict quality specification requirements. 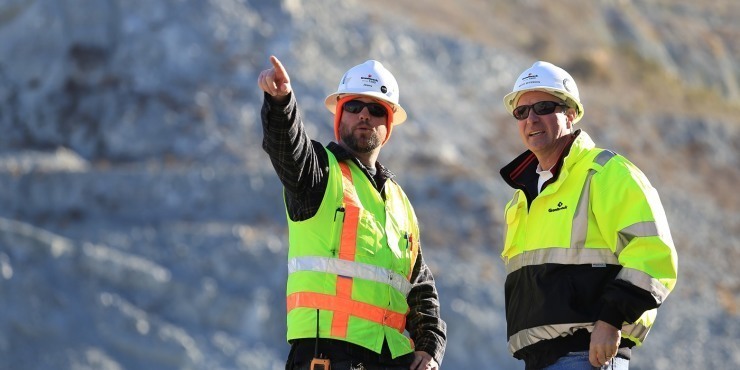 Consistently monitoring and evaluating the quality of aggregate products using Statistical Process Control methods, and providing constant feedback to the Aggregate Division production teams. Testing and evaluating the quality and suitability of aggregates from potential new Graniterock aggregate sources. Assisting in geologic exploration activities to expand and/or develop new Graniterock aggregate sources. Submitting certifications to customers documenting that Graniterock aggregate products meet project specification requirements. Providing education about aggregate products to Graniterock People and customers through classes, seminars, and tours. Proportioning concrete mixtures to meet a range of specification requirements for workability, strength, and durability. Providing internal quality control support to all Graniterock Concrete Branches by performing field and laboratory testing of fresh and hardened concrete. Providing quality assurance for Portland Cement used by Graniterock Concrete Branches through periodic sampling and testing of physical properties. Submitting certifications to customers documenting that Graniterock concrete mixtures meet project specification requirements. Monitoring and evaluating strength and workability histories of Graniterock mixtures to ensure consistent quality and to determine if adjustments may be needed in proportions or production operations. Performing research on new concrete materials and mixtures to ensure Graniterock uses state-of-the-art technology to effectively utilize resources and create high-performance concretes for Graniterock customers. Assisting Graniterock Concrete Branches in concrete batching operations by entering new mix design information or adjusting existing mix designs in the Systech Dispatch System. Investigating and diagnosing deficiencies of in-place concrete and recommending appropriate repairs or other corrective action to mitigate the impact of these deficiencies. Providing education about concrete technology to Graniterock People and customers through classes, seminars, and technical notes. Designing HMA mixtures that meet Caltrans, FAA, or other agency requirements for all specified levels of quality. Reviewing specifications, developing project quality control plans, and providing Quality Control/Quality Assurance laboratory and field services to Graniterock Construction Division and other contractors constructing Caltrans and FAA pavements. Providing laboratory testing services to Graniterock HMA plants located at A.R. Wilson Quarry, San Jose, Redwood City, and South San Francisco in order to help ensure production of consistent, high quality HMA. Regularly monitoring and evaluating the HMA quality of these plants using Statistical Process Control methods. Submitting certifications to customers documenting that Graniterock HMA mixtures meet project specification requirements. Performing roadway smoothness testing immediately before and after pavement construction, and subsequently on an annual basis in order to assess mix and construction effectiveness in creating wear-resistant pavements. Performing research on new HMA materials, mixtures, and construction procedures to help develop criteria for stronger, more durable HMA pavements using Graniterock materials. Investigating and diagnosing HMA pavement deficiencies and recommending process and material improvements to eliminate them. Providing education about HMA technology to Graniterock People and customers through classes, seminars, and technical notes.